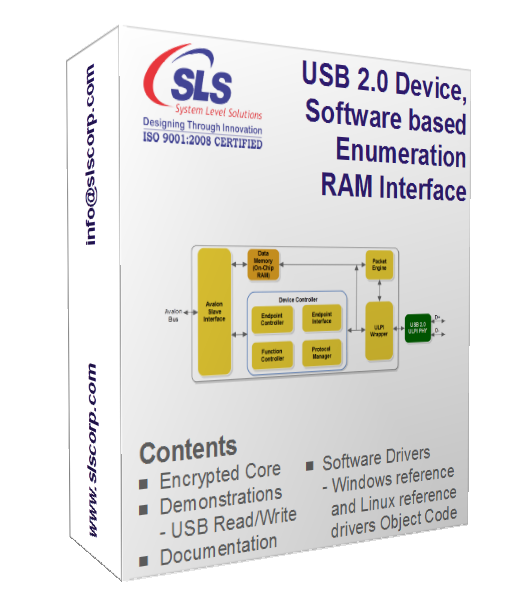 The USB 2.0 Device, Software Enumeration (USB20SR) IP Core is a RAM based USB 2.0 device core with 32-bit Avalon interface and ULPI interface support. The core supports both High Speed(480 Mbps) and Full Speed(12 Mbps) functionality. The core supports three preconfigured endpoints Control, IN, and OUT. It can be configured for up to 15 IN as well as OUT endpoints on customer's request at additional cost. The package includes ModelSim precompiled library of Host-BFM with predefined test cases for IP core simulation and verification. IP Core has been tested by interfacing it with USB 2.0 PHY on SLS CoreCommander development board. USB20SR IP core's functionality is verified in ModelSim simulation software using test bench written in Verilog HDL.